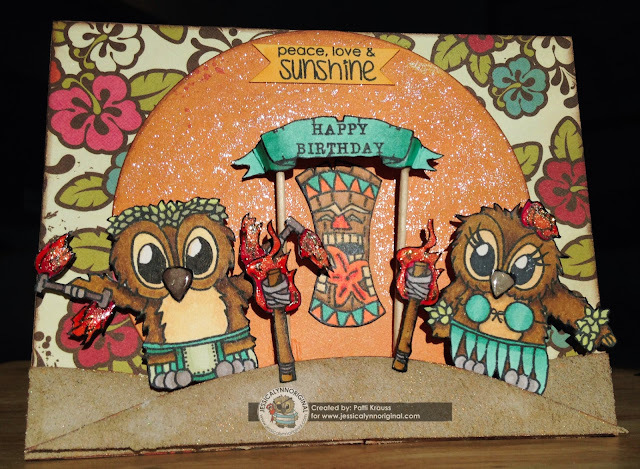 Here's the 2nd card in my series - I couldn't resist making a beach scene with these adorable Hawaiian Brentwoods. Thanks for joining us for the launch of this stamp set. Hope you have a super day and that you take some time for fun! Stamp the images onto smooth white cardstock with Memento black ink and color with Spectrum Noir markers and fussy cut them. Add glossy accents to beaks, flower and fire, then add ultra-fine glitter to the flower and fire. Cut background patterned paper to fit A2 card base and ink edges. Cut large circle from orange patterned paper, ink edges, add some glitter brush pen, then add to center of card. Cut beige cardstock into hilly shapes for the sand dunes, cover with sand texture paste, then color with Opal Sea Oats spray. Add the beach dunes to the bottom of the card. Use toothpicks to make banner with the Happy Birthday banner image, then add to card. Add Tiki under banner, then use foam dots to add the Brentwoods on the dunes. Finish with the Tiki torches in front of the banner and the Peace, Love, and Sunshine sentiment cut into a banner at the top. Very beautiful! Love what you did with that banner too....so cool!